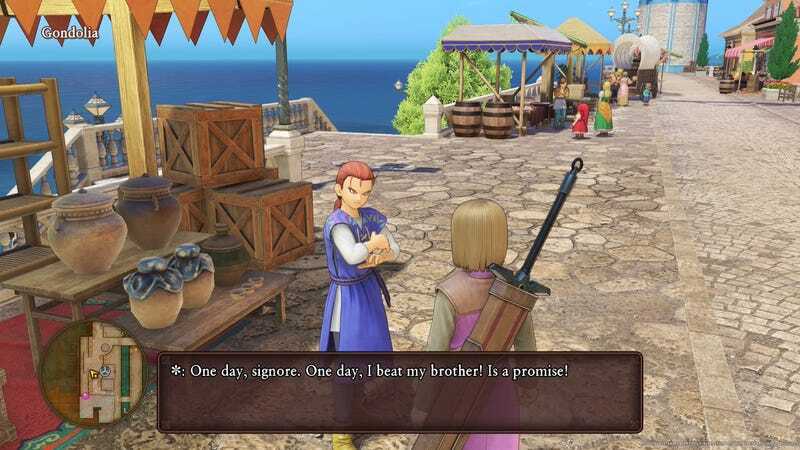 Playing a main series Dragon Quest game is a serious time investment. I’ve finished half of them, and the last three I played (V, VII, and VIII) each required almost 100 hours. But there’s something special about the games that director Yuji Horii is involved with, whether it’s the Dragon Quest games, Chrono Trigger, or even the classic adventure game The Portopia Serial Murder Case, that make those hours go by quickly. A major part of the signature Horii touch is the attention to detail in almost every aspect of the game’s inhabitants. 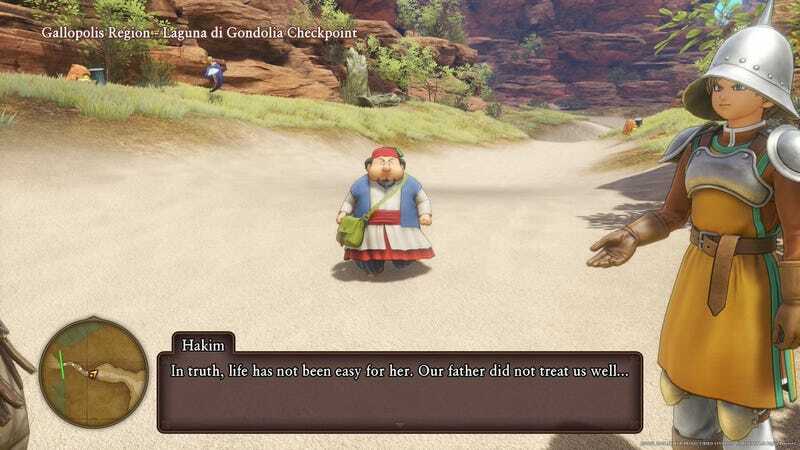 Dragon Quest XI is full of quirky, funny, and tragic NPCs that make the world feel alive and a joy to spend time in. They give the story more gravity because you actually care about its inhabitants. Saving Erdrea means rescuing people you care about. Here are some of the ones that were most memorable for me from the first half of the game. 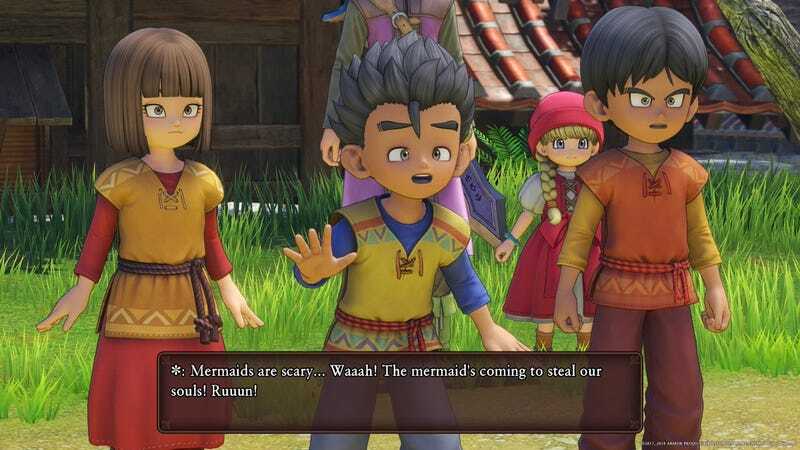 In Dragon Quest XI, everyone gets attention. Priests at churches have a personality as they carry out their functions. Sometimes they’re sombrely warning you, other times they’re reveling in drinks at a celebration. Storekeepers comment on the news of the day and are affected by events, like in Phnom Nohn, when many of its inhabitants have been kidnapped. One of the children has actually taken over for her mom and there’s a desperation in her voice as she says, “My mother is coming back. I know it. I am only looking after the shop until she returns. Maybe you would like to buy something, sir?” Even though I didn’t need anything, I bought a bunch of stuff from her. Laguna di Gondolia has one of the most hilarious sales interactions. There are two brothers who are merchants and one of them sells a catsuit for 10,000 gold—pricey, to say the least. If you go to his brother and tell him about the initial offer, he’ll offer the same suit at a lower price. By going between the two brothers, their competitive nature takes over, and you can bargain them down to 1,000. The funniest part is how aggressive they get in their haggling and how much of their relationship is conveyed through their angry dialogue. You can tell this rivalry has been going on for years, and I couldn’t help but wonder what family get-togethers were like for them. This cycle continues later on with a very strong armoured suit, which has the additional effect of changing the wearer’s appearance. The first brother sells it for 100,000 gold, which is very steep. Go to the other brother, who makes a “special offer” of “only 50,000 gold coins.” The haggling continues until one of the brothers offers it at 5,000 gold because “I cannot lose to my brother! I do anything to beat him!” It had me cracking up as I bought this badass armour at a 95 per cent discount. 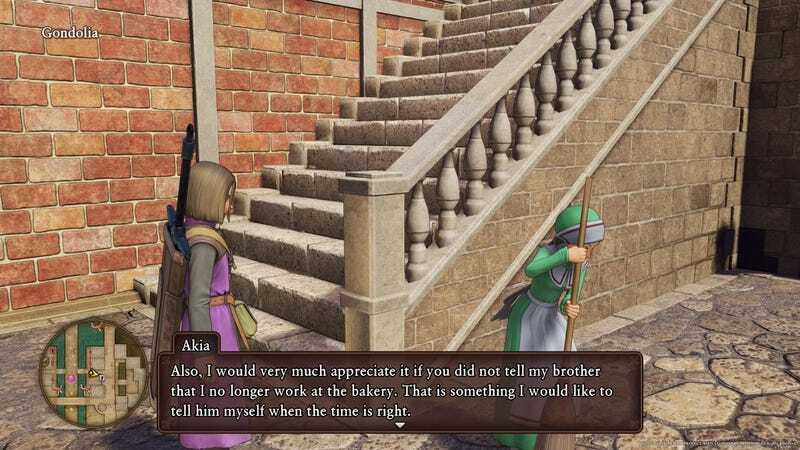 While Dragon Quest XI has a massive world, these touches for background characters that are usually relegated to functional uses (buy, sell, save) help make it feel smaller, more personable. 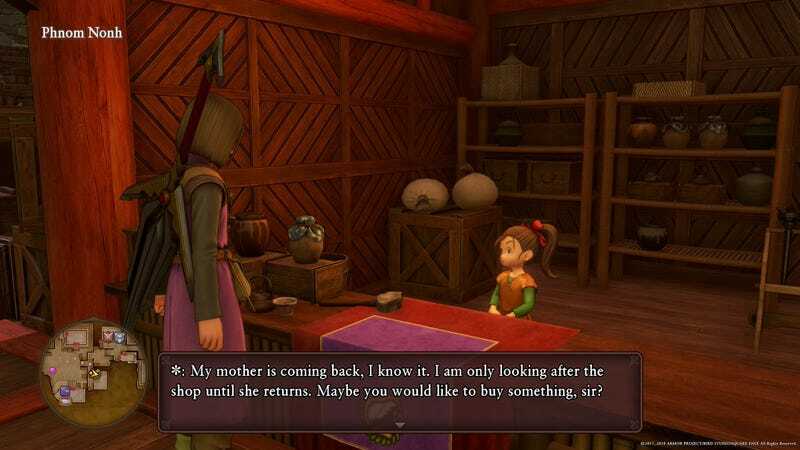 When was the last time you remembered a shopkeeper in a RPG? One of the most moving sidequests seems simple on the surface. Deliver “A Lovely Letter” from a soldier, Hakim, in the Gallopolis region to his sister, Akia, in Laguna di Gondolia, which is where the hero is heading. She’d gone there to pursue her dream of becoming a baker, but Hakim hasn’t heard from her in some time. As a footsoldier, he doesn’t have the liberty of leaving his post, so he is desperate for help. After you accept and head over to the bakery in Gondolia, you learn Akia actually quit and is now working as a maid for Doge Rotondo. You find her sweeping the floor outside, and once you hand her the letter, Akia eagerly opens up it up. She reads the letter to find what Hakim has written: “Now that the misery of our old life is a thing of the past, I pray that you are enjoying your freedom. I cannot wait to see you blossom into a fully-fledged baker.” He had placed a few gold coins in the letter to support her. She asks if the Luminary (that’s you) can return a letter, but also not to tell Hakim that she no longer works at the bakery. The letter she writes is equally painful. “I know that it cannot be easy for you to have to support us both. If it were not for your assistance, I would be unable to follow my dream of becoming a baker… I will continue to work hard, Hakim. I want you to be proud of me.” She continues the lie so that both of them can keep going, persisting through their difficult time with hope. The story doesn’t end here. As Hakim reveals, their tragedy isn’t the evil monsters of Erdrea. It’s their father. “He was once a kind and gentle man, but then he suffered a terrible injury, which made him horribly bitter. Akia and I would often bear the brunt of his frustration.” Hakim is fighting for her future to try to make up for her past. The interesting thing is, neither letter is integral to the plot. The material reward is just a cookbook. But the developers had changed what would normally be a simple trading quest into a glimpse of a family tragedy, where you realise even the freedom of being able to wander from town to town is a privilege. I wanted to give them some of my hoarded gold just to help them. The follow-up quest reveals even more about their circumstances and has a touching conclusion. This quest, more than all the monsters I’d fought and evils I’d vanquished, made me feel like a true Luminary, someone trying to restore light to a world being consumed by human darkness. The playable characters in Dragon Quest XI have really great story arcs and the party talk option is an excellent way to gauge everyone’s mood. Every campfire break has interesting exchanges, and the fact that you can swap characters out at any time in battle means everyone gets field time. But it’s still Horii’s NPCs that steal the show, as in other games. This includes Chrono Trigger’s Fiona and her dream of reforesting the Sunken Desert, or the priest in Vogograd who sacrifices himself in Dragon Quest VII for the mental wellbeing of his fellow townspeople. 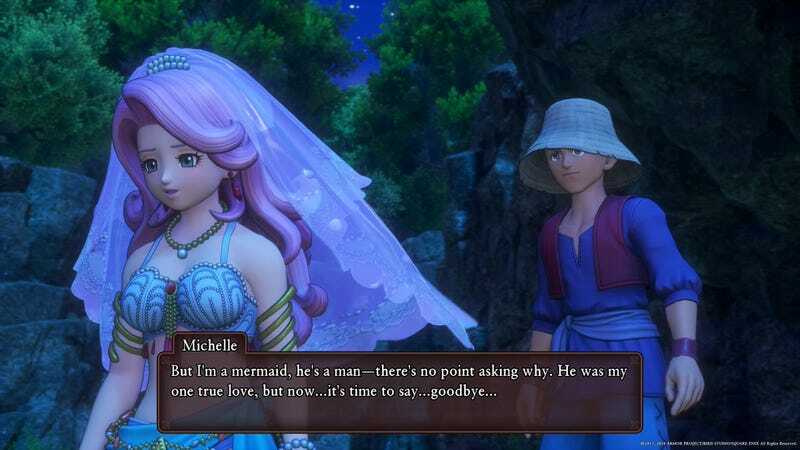 In Dragon Quest XI, an encounter with a rhyming mermaid named Michelle leads to one of the most memorable quests in the game. Initially, Michelle mistakes the Luminary for Kai, the human lover she’s been waiting for. Kai had promised to return so they could get married. When one of your teammates, Veronica, questions whether a human and mermaid can be wed, Michelle explains the Mermaid’s Burden: “If a mermaid leaves the sea and makes the land her home, if ever she gets wet again, she melts away to foam.” Because of that curse, Kai promised to come to the sea with her, and they received special permission from the Queen Beneath the Sea to live together in the underwater city Nautica. Michelle asks if you can go to Lonalulu and check up on him. But when you get to Lonalulu, you learn that interspecies love isn’t exactly a popular political position. The citizens of the sea village despise the mermaids, believing they have a bewitching influence on humans. Horii’s narratives often play with public perception this way, so that those you think are the heroes turn out to be villains, and vice versa, and back again. 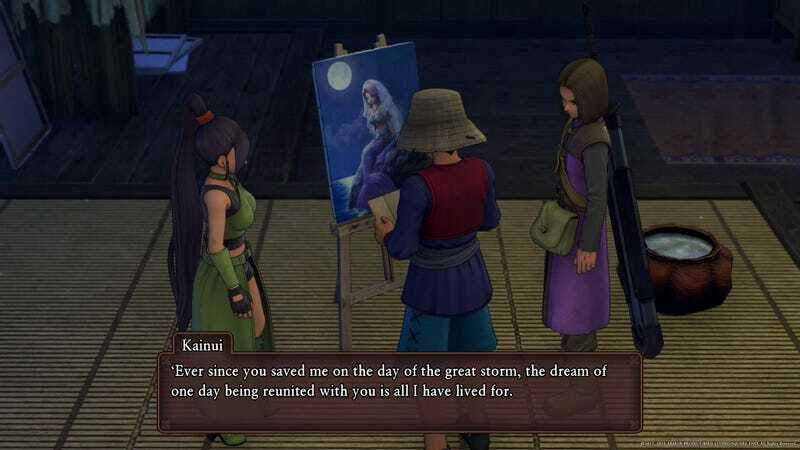 Eventually, the party finds Kai’s mother, who tells them the story of one of the village’s best fishermen. 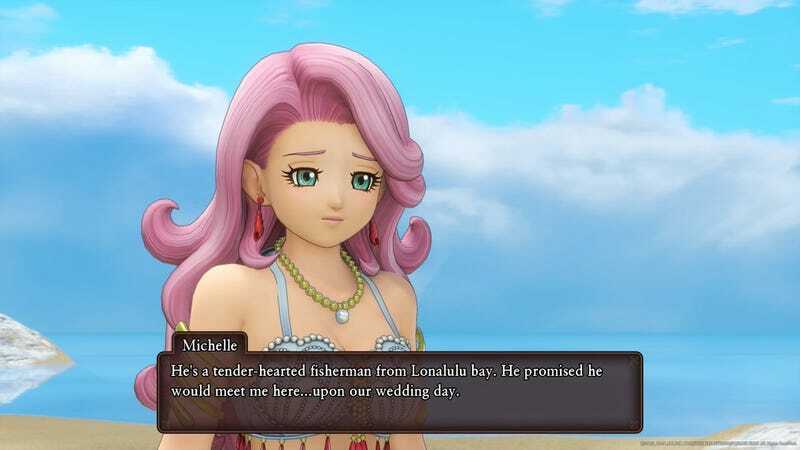 The mayor of Lonalulu, the Big Kahuna, gave the fisherman “the hand of his beloved daughter” Leilani. But when he got lost in a storm, he was rescued by a mermaid who stole his soul, causing him to forsake the woman he was engaged to. Even when he returned to Lonalulu, he just wanted to get back to the mermaid. Eventually, the fishermen was banished to Saikiki and forbidden from sailing again. I was confused on which version of the story was true. Had Kai had his soul stolen, or had he fallen in love? When your party finally meets Kai, he at first is confused and tells you his full name is Kainui, then realises they have him mixed up with his grandfather, Kainoa. Since mermaids have much longer lives, a generation had passed since Kainoa had met the mermaid. You learn from Kainui that the fishermen in his mom’s story was Kainoa, her father and his grandfather. Shortly after being exiled, a storm killed the chief Kahuna as well as his daughter’s new husband. Leilani had previously given birth to a new baby with her husband, but mother and daughter also disappeared. The villagers, believing the mermaid had taken them as revenge, were furious, and marched to Saikiki beach to confront Kainoa. They found him there with a baby whom they believed was the unholy result of a mermaid and a human. Shocked, they left him there. But that baby was Kainui’s mother. Did that mean Kainui was a quarter mermaid? I have a confession to make before I go on. When I was much younger, I watched an animated version of The Little Mermaid—an anime film released in 1975 by Toei, not the Disney version. It was one of the few movies I remember bringing me to tears and I was sobbing because the ending, based on the original Hans Christian Andersen story, was so sad. So as I played through this scene, learning the true identity of that baby, it brought back flashes of that memory. The party learns from a letter Kainoa left behind that he wanted to return to the mermaid, but he could not keep his promise after his exile. That was because he saw his ex-fiance, Leilani, “standing on the cliffs” of Saikiki Beach. “With her father and husband gone, she had lost all hope… and reason… Before my disbelieving eyes, she threw herself into the ocean.” Kainoa tried to save them, but only the baby survived. Wracked by the guilt of his ex-fiancée’s death, he felt he had a responsibility to take care of their child. So he stayed behind and raised her as his own. While I didn’t openly sob this time around, I had to blink back tears. As the Luminary, my primary power was to shine a light on the truth. But I was powerless after I told Michelle the truth about what happened, and she opted to sacrifice herself. She faded away into foam, their love never fulfilled. I was aghast. Even writing this article, I still feel depressed thinking about their love and the weight of remorse that must have hammered Kainoa everytime he looked at his new baby. He bore the censure and contempt of the villagers without protest, feeling it was just punishment for what his actions had caused. 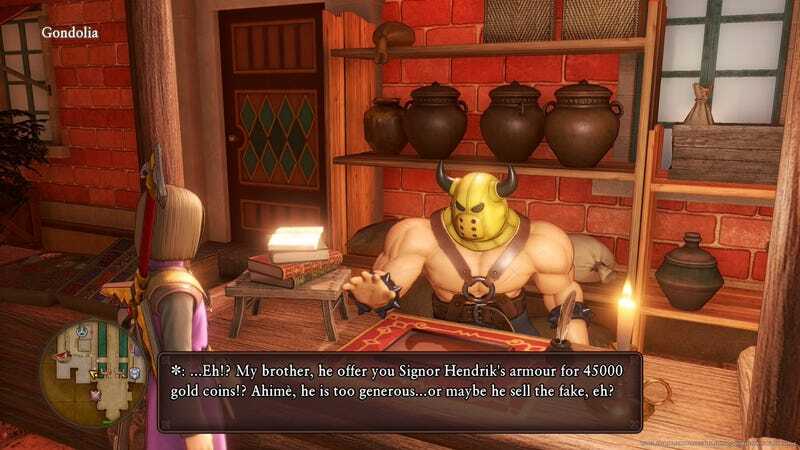 There are so many more great NPCs in Dragon Quest XI. I could go on about the prince of Gallipolis pretending to be someone he’s not, the whole troupe of Sylvando’s Smile Brigade, or some of the wackier encounters players face in the Masked Martial Arts tournament of Octagonia. While the overall quest is of an appropriately epic scale in this eternal battle of good versus evil, it’s the all-too-human struggles of the minor character that make the game really stand out, echoing elusively about relationships that resonate long after we’ve left the world behind.